In 2016, I walked into a Starbucks in Hollywood, California and asked for a code to use their restroom. I was initially denied access by a black male barista because I hadn’t purchased anything, so I bought a drink. Later, that barista explained to me they enforced the policy to prevent the homeless from taking “bird baths” in their restrooms. Was that barista racist or sexist? Starbucks is finding out that leftism has no allies - just a collection of useful idiots. 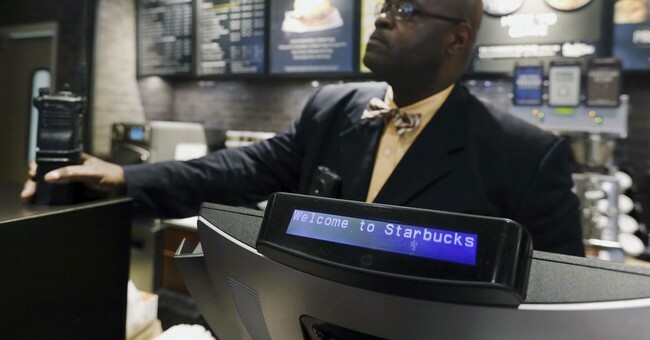 Starbucks has successfully created a culture and atmosphere for clientele willing to pay their high prices for coffee. Loiterers endanger that culture. Have you ever stopped to consider what racism at a Starbucks might look like? I imagine their baristas would refuse to serve minorities coffee – they certainly wouldn’t hire minorities. Perhaps, there’d be separate restrooms and seating areas for blacks and whites. Regardless of what we might see were this establishment institutionally racist, what we wouldn’t see is a white manager eager to serve her customers and follow policy, by asking two black men “may I get you a cup of coffee or kick rocks” – I’m paraphrasing. For one, he gave blacks permission to scream “racism” based upon feelings, not facts. Additionally, young blacks who are living in an era in American history where true racism is the exception and not the rule, he’s given them an excuse to blame life’s setbacks on their race rather than their effort. There’s no boogie man holding you back in America today. What Kevin Johnson doesn’t realize is that it’s impossible to police feelings. Thanks to our Constitution and civil rights leaders like Martin Luther King Jr., we can correct wrongful behavior through law and societal pressure. Race relations have been stunted for a decade because of Johnson’s actions. Let’s be honest, Millennial blacks have not and will not experience slavery or Jim Crow laws like our ancestors. Thus, there’s no form of reparations or appeasement that will satisfy young blacks that have been taught by white liberals that microaggressions and white privilege are proof of racism. You can’t fight an enemy you don’t see or rectify a problem when an offense is left to one’s own imagination. Subjective truth isn’t truth. Leftism denies progress: if all societal problems were solved, we’d have no need for leftists or their political party, and they know it. Democrats are void of solutions because they’re not searching for them. They need grievances to exist for their party to remain viable. As Americans, we abolished slavery, put an end to Jim Crow segregation, and even mandated reparations through “Affirmative Action” – thank you Republicans. It seems to me any sensible conversation on race should begin with how far we’ve come. Leftism offers no repentance: Bloomberg reported that Starbucks “has spent years making inclusivity a core part of its brand. Just weeks ago, it issued a press release touting its ‘100 percent pay equity’ for workers of all races and genders…” Not to mention, Starbucks had their employees write “race together” on cups in recent years to encourage conversations about racial issues. Oh, and let’s not forget, last year to protest President Trump’s decision to place a temporary ban on immigrants from hot zones in the Middle East, Starbucks announced plans to hire 10,000 of those refugees. Despite all of this, blacks are still upset with Starbucks today. White privilege and Microaggressions promote divisiveness, not inclusivity: Why give any race an excuse to hate another? “White privilege” and so-called “microaggressions” aren’t indicators that racism is still prevalent in America. To the contrary, they’re proof that cases of racism in America are rare. Consequently, instead of enjoying the racial progress that our ancestors made, young blacks are finding reasons to yell “racism” if their feelings are hurt. It’s as if they have it so good they don’t know what to do with themselves. White liberals truly did themselves a disservice by creating these terms. As we’ve witnessed with Starbucks, no one is free from scrutiny and race baiters are happy to have job security. Kevin Johnson’s apology tour is silly and will do nothing to heal race relations in America. Ultimately, he’ll keep race-baiters employed, and blacks angry. Great job at keeping us divided Mr. Johnson.